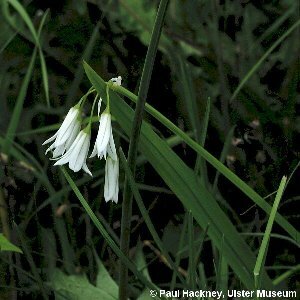 A bulbous plant, native of the western Mediterranean region but widely grown in gardens in Ireland. It is frequent as a garden escape on roadsides near gardens, or in places where garden rubbish containing the bulbs has been dumped. 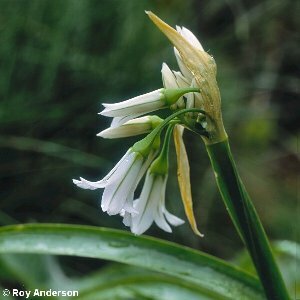 The plant has an umbel of drooping white flowers, stems which are sharply triangular in cross-section and a strong smell of garlic when crushed. It flowers from late winter to June. All names: Allium triquetrum L.